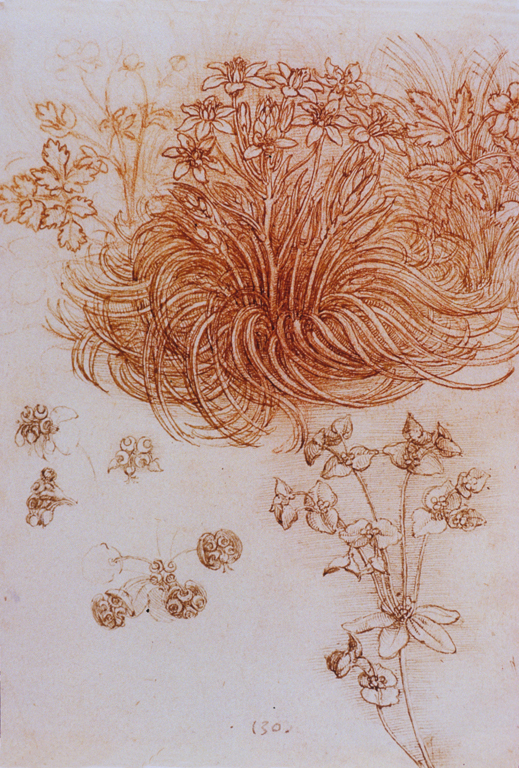 Around 1505-1510 Leonardo made several drawings of plants for the foreground of a painting of Leda and the Swan, which was destroyed around 1700. His interest in the structure of individual species, however, went far beyond what was necessary for a painting; here he pays close attention to the form of the spurge's flowers (lower right). The Star of Bethlehem (Ornithogalum umbellatum) at top has basal leaves in a whorl, a form that interested Leonardo. Windsor Castle (Windsor, England, United Kingdom) RL 12424; Royal Library. Bequeathed to Francesco Melzi; probably acquired by Charles II; in the Royal Collection by 1690. 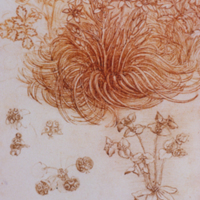 Leonardo da Vinci (Italian artist, 1452-1519), “Star of Bethlehem, wood anemone, and sun spurge,” Institute Images Online, accessed April 24, 2019, http://westerncivart.com/items/show/2945.